Op. 2 No 2 in D minor. 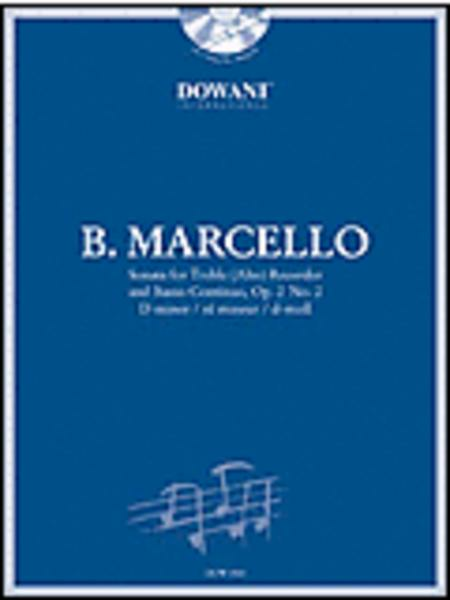 Composed by Benedetto Marcello (1686-1739). Edited by Manfredo Zimmermann. 3 Tempi Play Along. Play Along. Book with CD. Hal Leonard #DOW 02504-400. 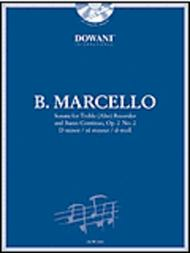 Published by Hal Leonard (HL.44006430). ISBN 9783905476583. 9x12 inches. International (more than one language). DOWANI 3 Tempi Play Along is an effective and time-tested method of practicing that offers more than conventional play-long editions. DOWANI 3 Tempi Play Along enables you to learn a work systematically and with accompaniment at different tempi.Thefirst thing you hear on the CD is the concert version in a first-class recording with solo instrument and orchestral, continuo, or piano accompaniment. Then the piano or harpsichord accompaniment follows in slow and medium tempo for practicepurposes, with the solo instrument heard softly in the background at slow tempo. Finally, you can play at the original tempo to the accompaniment of an orchestra, piano, or basso continuo.Allversions appearing on the CD were recorded live by renownedsoloists, accompanists, and orchestras. There are no synthesised sounds in a DOWANI edition! Professor Manfredo Zimmermann - eine anerkannte Kapazitat auf seinem Gebiet - hat diese bekannte Sonate von Benedetto Marcello herausgegeben und eingespielt. Da diese Musik ihrem Ursprung entsprechend sehr stark auf improvisatorischen Elementenberuht, wurden nur die notigsten Verzierungen und Phrasierungen hinzugefugt. Der Spieler oder die Spielerin darf/soll gerne eigene Erganzungen (Triller, Mordente, Bindungen etc.) vornehmen. Dies gilt naturlich auch fur die Ausfuhrung desGeneralbasses (Basso continuo oder Cembalo). Le professeur Manfredo Zimmermann - un expert reconnu dans ce domaine - a edite et enregistre cette sonate celebre de Benedetto Marcello. Cette musique repose a l'origine beaucoup sur des elements d'improvisation ; c'est pourquoi nous n'avons ajouteque tres peu d'ornements et de phrases. Chaque musicien peut ou doit ajouter ses propres indications (trilles, mordants, liaisons etc.). Cela concerne egalement la realisation de la basse chiffree (basse continue ou clavecin).